Mrs. Yi doesn't like frogs legs, or for that matter, any kind of reptile meat. Last night, she went out to dinner with her mosaics class, so it was a perfect opportunity for me to fix them. I certainly had no dearth of recipes from which to choose. Last Christmas, my youngest son Dylan gave me Ernest A. Liner's The Culinary Herpetologist, Bibliomania, Salt Lake City, 2005. Therein are 112 recipes for frogs legs alone, not counting toad legs, numerous other recipes for frog meat, and of course turtles, crocodiles, various kinds of snakes, and lizards. Reptiles, along with unusual seafoods, have always been a thing with Dylan and me. This goes back to his third birthday in 1980, when sushi and sashimi first arrived in Baltimore. Dylan eschewed being thrown a party in favor of going out to eat "raw octopus." I'm convinced that most people who've had frogs legs like them. I've prepared them many times and in many ways. Even still, 112 new recipes were a lot to mull over for this post. I'd gone through the same drill a couple weeks ago and opted for "lemon-deviled frogs legs." They were delicious, but the breadcrumbs didn't stick. If you're breading frogs legs, even with a batter, look out for some of it peeling off prior to presentation. Our pepper fried frogs legs held together as well as could be expected. In fact, the ingredients and technique used for breading them had everything to do why I chose this recipe. Despite a lot less pepper than the title "pepper fried frogs legs" would suggest, the end product was most satisfactory. What most impressed me was how well the frogs legs retained their mosture. This is a good recipe. Arrange frogs legs in a shallow container. Mix eggs, mayonnaise, cornstarch, lemon juice, baking powder, salt and pepper and stir until smooth. Pour over frog legs and cover and chill for at least 30 minutes. Combine the flour and bread crumbs in a paper bag. Remove legs from marinade, shaking off excess, and place 2-3 legs at a time in the flour mixture. Shake until legs are well coated. Pour oil to a depth fo 2-3 inches in a dutch oven and heat to 375 degrees. 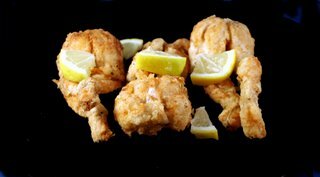 Fry legs 1-2 minutes or until dark golden brown, then drain on paper towels. Serves 6. From The Culinary Herpetologist by Ernest A. Liner, Bibliomania, Salt Lake City, 2005.